Water Your Lawn With A... Dishwasher? Homeowners were installing greywater systems themselves without permits, or they hired plumbers who looked the other way. Over 20 years in Santa Barbara, city officials say, only four residents ever obtained greywater permits, much less paid the fees, set at $350 today. Meanwhile, hundreds, if not thousands, embraced do-it-yourself "laundry-to-landscape" diversions, bought biodegradable soap, connected their washers to outside hoses and emptied buckets of bathwater in their yards. 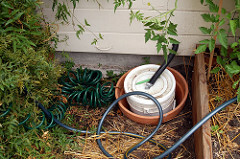 The Greywater Guerrillas, a Bay Area group that billed itself as part of the "Water Underground," helped spread the know-how, and by 1999, according to a survey by the Soap and Detergent Association, nearly 14 percent of California homeowners were using greywater in their backyards. Today, that would be about 1.7 million households operating largely under the radar of city and county building inspectors. That growth is reflected in the Guerillas name, which has changed to Greywater Action. So under California's new rules, all homeowners will be able to install gray-water systems without a permit. And, as long as the recycling's handled correctly—drip irrigation only, don't use it to water vegetables, and no reusing water that's been used to clean diapers—the health risks appear to be minimal. No one's ever gotten sick from gray water, and soil will break down the toxins and micro-organisms. Plus, advocates say, diverting gray water reduces the volume of sewage that eventually gets dumped into rivers and oceans. Now, granted, the pros and cons can vary from place to place. In water-starved Nevada, for instance, water authorities have strongly opposed the whole concept, since they'd prefer that everyone's wastewater just swirl down their drains, where it can go off to get treated and then dropped back into Lake Mead, allowing the state to draw another gallon out (a decent idea given that the lake's running perilously low). Still, it's hard to see the downside for California.